Bargain hunters can find Samsung's 15.6-inch E251 for 399 euros at various retailers. 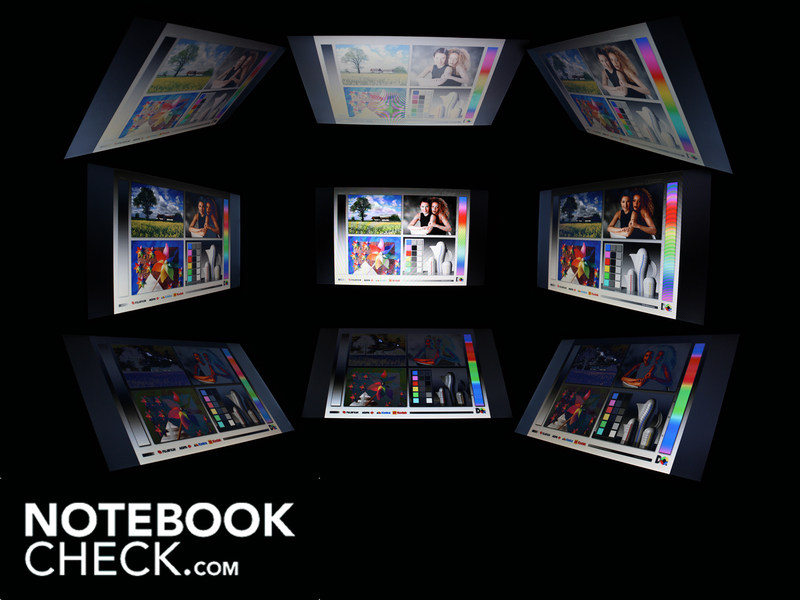 Is this a premium office notebook or a cheap mass-market product? It delivers well on performance and ergonomics, but its portability and screen quality give us pause for thought. Would fans of Samsung be better off keeping their distance? 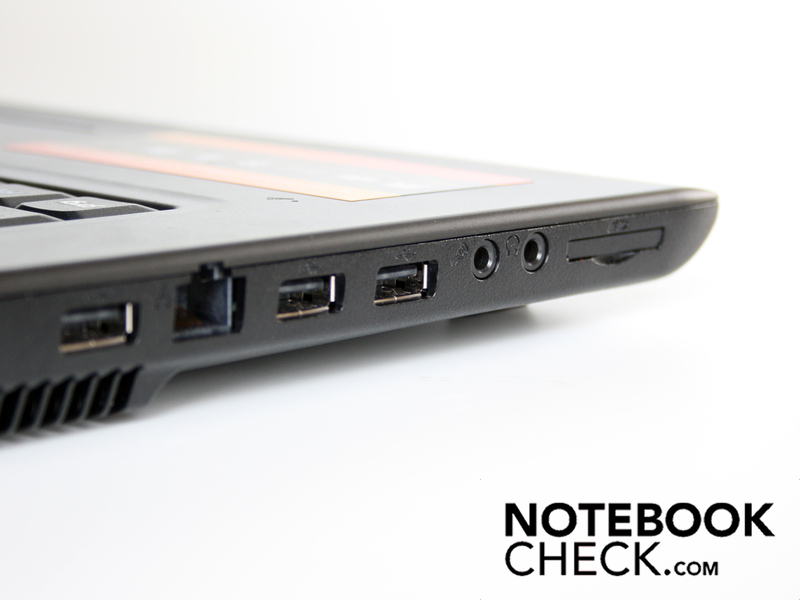 We tested the E251 from top to bottom. Office laptops typically cost no more than 450 euros these days. They are reasonably mobile typewriters, usually fitted with pretty feeble hardware. This price range bristles with Acer Extensa machines, the HP Compaq 615 models and the Lenovo G550 series. Samsung has not been active in it until now, but times change. Samsung has moved away from its previously declared focus on premium quality, and is now sending models like the E251 Aura T4200 Esilo into the fierce battle for consumers. With its 429 euro price tag, it is roughly on a par with the Acer Extensas, which have identical specs. Bargain hunters can even find lightly trimmed-down versions for under 400 euros. 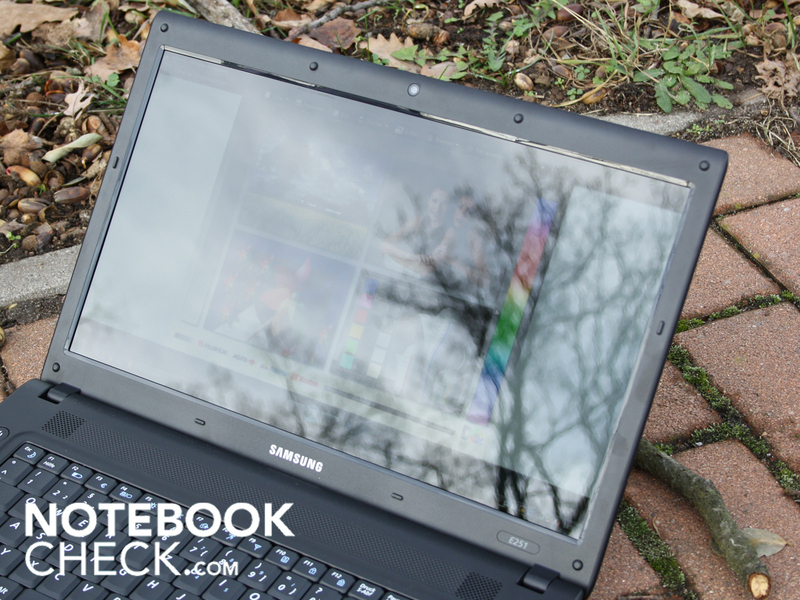 So is it worth spending your Christmas money on Samsung's budget office notebook? Visually, the Samsung E251 Aura T4200 Esilo is exactly what we would expect of an inexpensive office laptop: very down to earth. 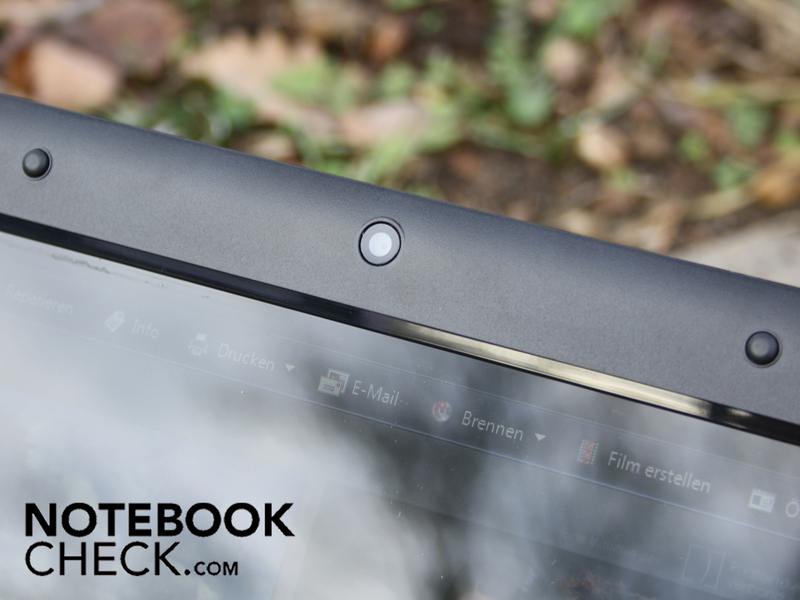 It has not a single glossy surface, other than the screen itself. Decorative elements such as silver strips, gently glowing status LEDs or stylish on/off buttons are nowhere to be seen. The loudspeakers are housed under an artlessly perforated surface above the keyboard. The manufacturer has done without any particular showcasing of its logo. 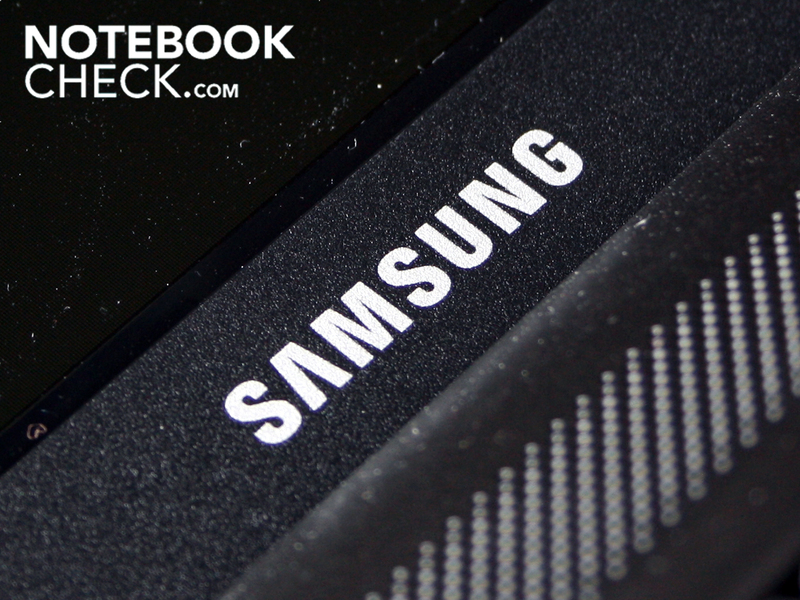 The Samsung brand-name is printed plainly on the lid and on the display edging. The matt surfaces of the lid and work area are made of a smooth plastic and attract virtually no fingerprints. The surfaces have a slight silvery shimmer to them. The underside is made of a rough, non-slip plastic. As far as robustness of the casing is concerned, this is not Samsung's best work. The base unit can be distorted a little using both hands. The palm rest area barely gives way at all under pressure, but the same can not be said of the touchpad area. 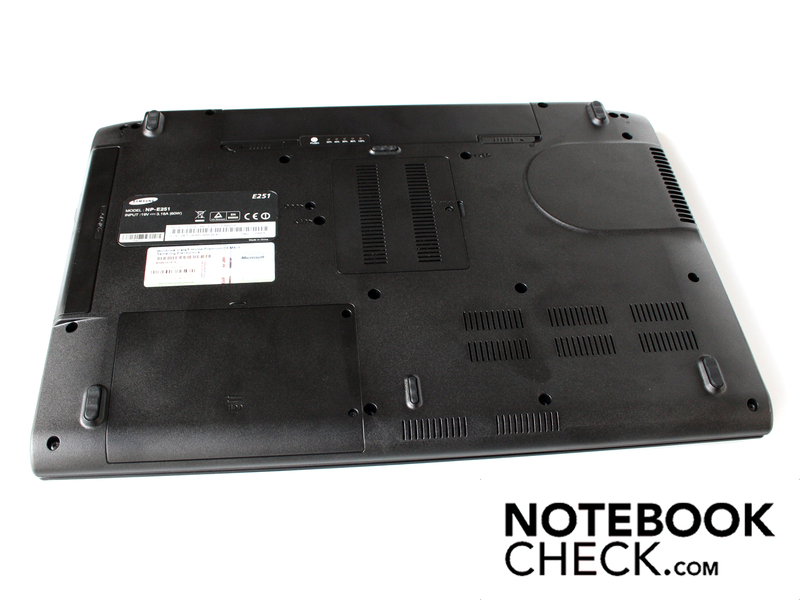 When the E251 Aura is resting on a desktop, pressure on the touchpad forces the laptop's underside to bow almost to the level of the table surface. This is simply because the central foot support is too short. On the underside we found a similar lack of robustness; light pressure can cause the plastic surfaces to bend in places. The lid is firmly held in place by its hinges, which are a little too tight. They look robust, being firmly mounted in their settings, and prevent the lid from wobbling at all when opened. The maximum angle the laptop can be opened to is sufficient for working with it on your lap, but the notebook cannot be opened to a full 180 degrees. On the other hand, this is because the E251 has so few ports that they can all fit on one side. Next to the power socket is the VGA (D-Sub) port, three USB ports, an ethernet port, two audio ports and a card reader. Fortunately the WLAN module did not fall victim to this minimalist approach to connectivity. 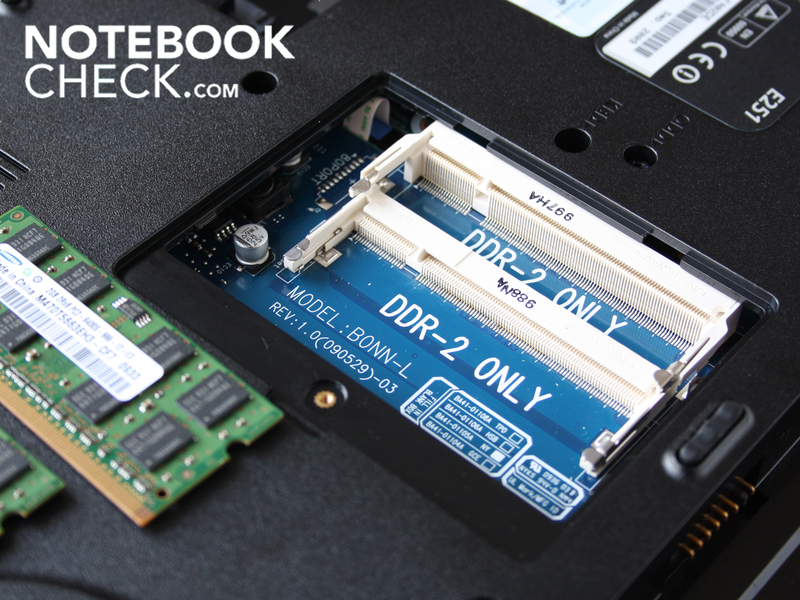 The notebook even has an Intel draft-n module. However, Bluetooth did not make the cut for this office laptop. This laptop's keyboard falls into the category of serviceable, but by no means perfect. The keys depress to a good depth but there is no clean point of impact. This makes typing feel spongy, although the keyboard sits firmly in place across its whole length. However, the keyboard layout is easy to get along with. The only issue is that the arrow keys are forced into the right-hand corner, making typos a little more frequent. The clear white lettering on the keys is commendable. It would have been nice to see a separate number pad, as this can be very useful for office tasks like working with spreadsheets or a calculator. There might have been enough room on this 15.6-inch notebook, if they hadn't left such wide spaces either side of the keyboard. The nondescript touchpad is built flush into the palm rest area. The two touchpad keys, covered by a large single key, lie in their own separate depression. The touchpad is pleasant enough to use, despite its apparently small size, as the surface is sensitive right up to the edges. However, Samsung has left out the Multi-touch function (Synaptics V6.3), so zooming or scrolling using two fingers is not possible. But users can scroll up and down and from left to right using the scrollbar. The horizontal scrollbar is not marked, which can lead to confusion when you first start using the touchpad. We often scrolled unintentionally to the left or right. 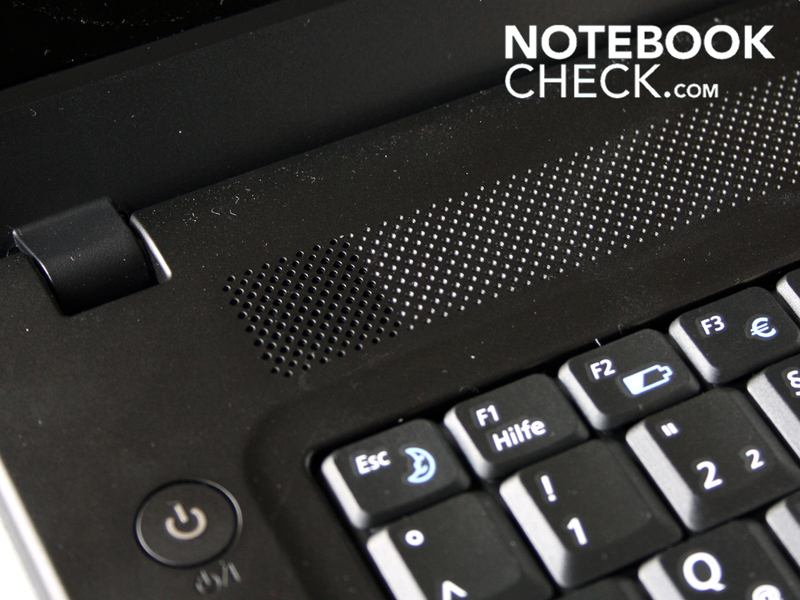 The touchpad keys make a clearly audible but cheap-sounding click noise when you press them. Samsung has used a WXGA screen with a native resolution of 1366 x 768 pixels. The 16:9 format screen is one of their own, an SEC3245 according to the system information tool. It does not have an anti-reflection coating, and so it will always be troubled by reflections to some extent. To judge just by looking at it, the contrast ratio of the screen seems very poor, whether on the highest or lowest brightness setting. The black value we measured was 1.14, and the contrast with maximum brightness was 203:1. The brightness is relatively uniform across the whole screen. We measured a maximum brightness of 203 cd/m² in the middle segment of the screen, and the least bright segment was 174 cd/m² in the bottom left-hand segment. This difference is not perceptible with the naked eye. The screen is not really suitable for use outside. Its reflective nature and average brightness mean that it cannot compete against bright sunlight. Strong reflections keep getting in the way of the screen contents. Users who like to sit and read their e-mails on the patio will definitely have to find themselves a shady spot. The E251 Esilo's viewing angles determine whether colours or text can still be made out clearly when looking at the screen from an angle. It turns out that users do not have much leeway with this 15.6-inch screen. If the vertical viewing angle changes, the colours start to fade at around 30 degrees. Horizontally you can deviate up to around 45 degrees from the centre, and only then do the colours begin to invert. 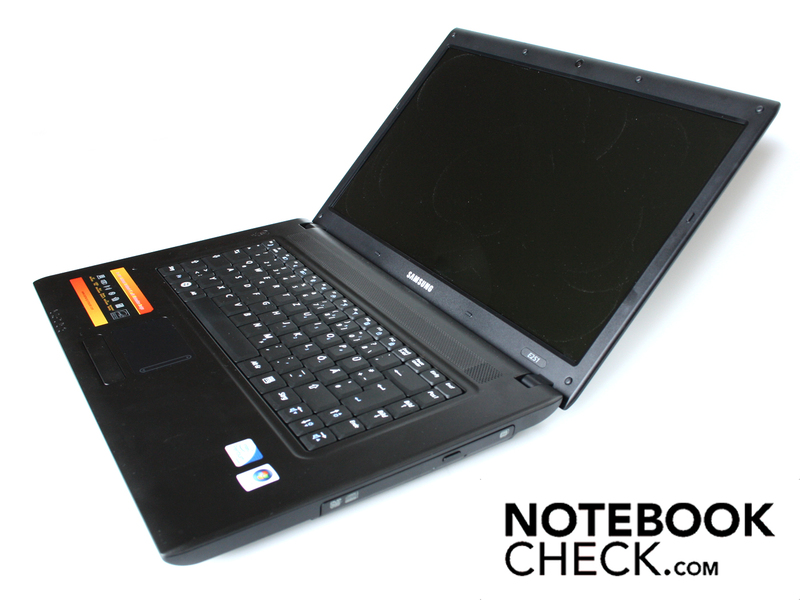 The notebook is equipped with an Intel Pentium Dual Core T4200 with a 2.0 GHz clock. The processor only has 1 MB L2 cache and a 800 MHz FSB. With a TDP of 35 Watts, it isn't one of the most economical processors around. It has two physical cores, but does not have Intel Hyper-threading. The T4200 is typically employed in inexpensive office or mid-range systems which are designed to have an optimally low price. The set-up is not as suitable for someone who often carries out processor-intensive tasks like video or photo editing, i.e. producing media content. Without a dedicated graphics card, the load cannot be taken off the CPU for various applications via Nvidia CUDA or ATI Stream. 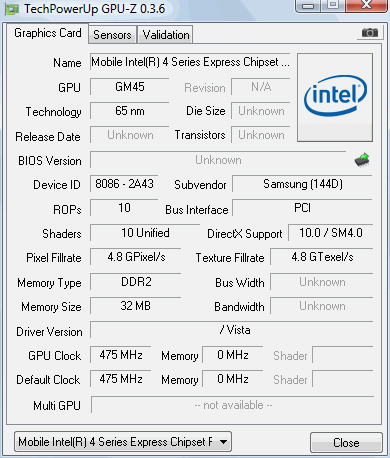 The Samsung E251 only has an Intel GMA 4500MHD integrated into the chipset and without its own video memory. We checked the latencies under Windows using the DPC Latency Checker tool. If they are too high it can lead to problems when external devices are connected (for example crackles with external sound cards or interruptions in real-time audio). The latencies were over 2000 µs at times. Faulty drivers for internal devices like the WLAN adaptor, sound card, or USB host controller are generally to blame. We measured the overall system performance with the PC Mark Vantage benchmark, which tests all the computer's components. Alongside the processor this includes the DDR2 memory, the access time to the hard drive and the graphics performance. 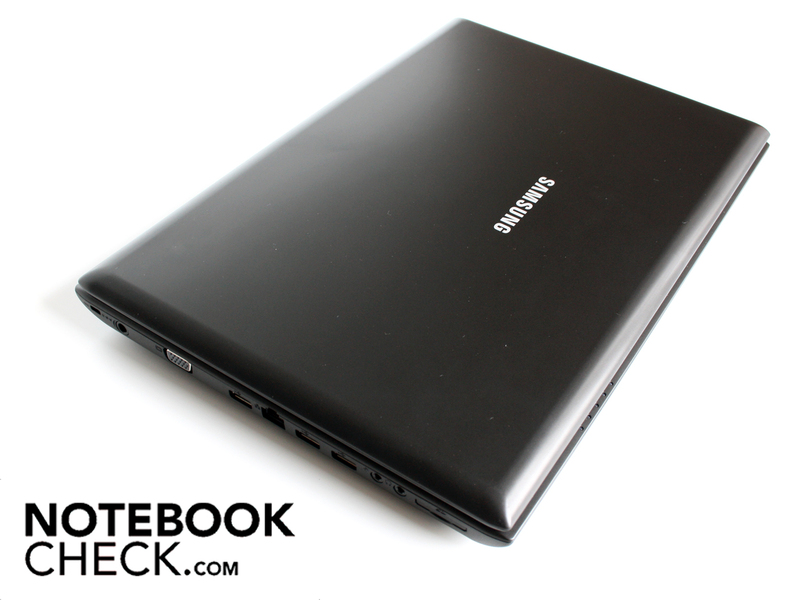 The Samsung E251 achieved a result of 2,736 points, a typical score for laptops with slower processors and without a dedicated graphics card. 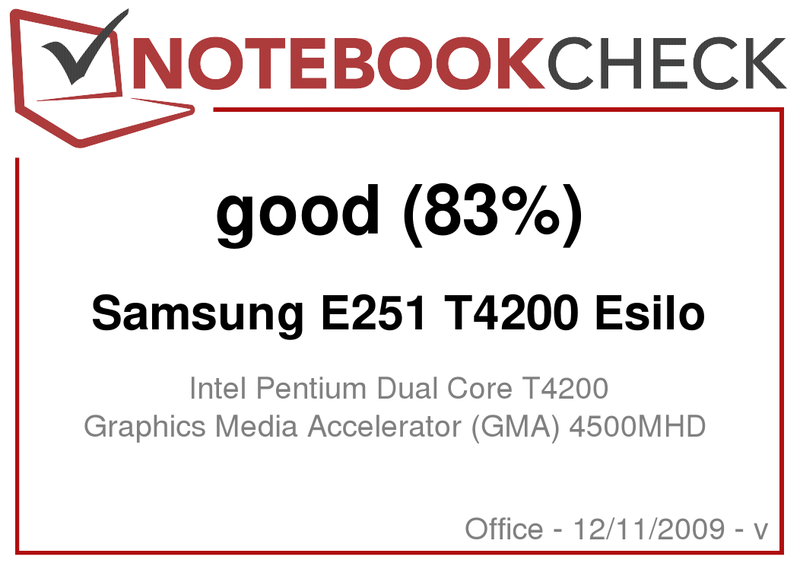 Even notebooks with the ultra-low voltage processor Core 2 Duo SU7300 achieve this kind of score in the PC Mark Vantage test. To get considerably higher performance you would first need something like the Intel Core 2 Duo P8700 and a mid-range graphics card like the ATI Mobility Radeon HD4570. But such systems are at least 200 euros more expensive. The Fujitsu hard drive (type MHZ2320BH), with a total capacity of 320 GB, delivered lower than average access times. We measured an average throughput of only 48 MB/s while reading, using the HDTune tool. 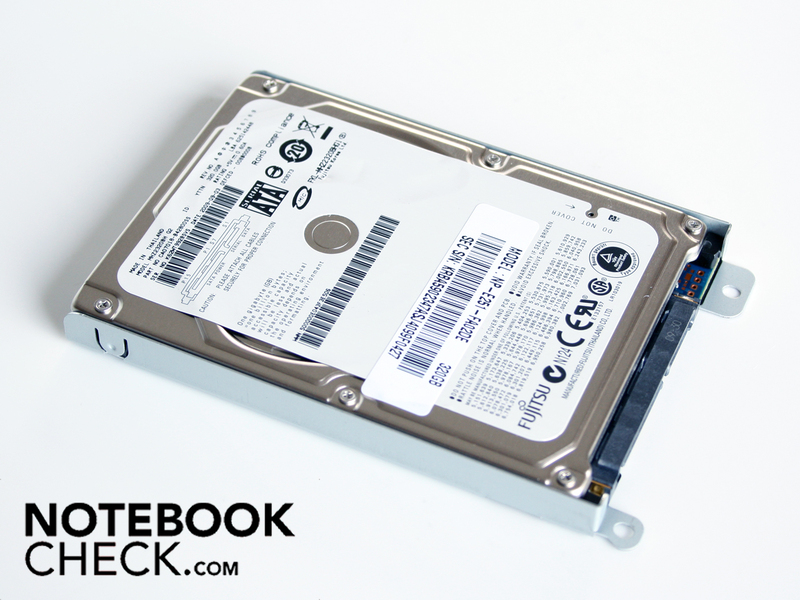 Modern notebook hard drives, which also run at 5,400 rpm like this one, generally achieve between 60 and 70 MB/s. So the Fujitsu HDD we have here is not the quickest. 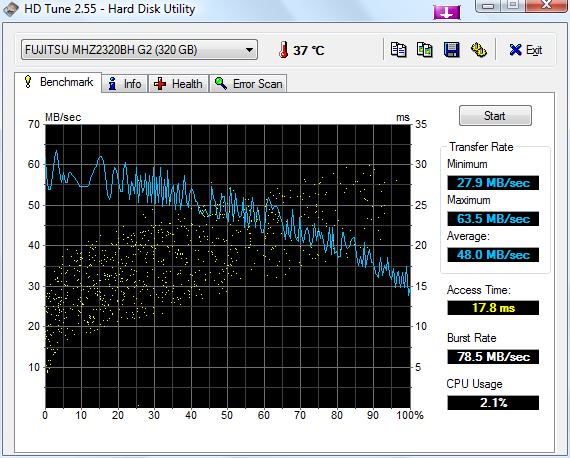 Though the Fujitsu hard drive is not the fastest of its kind, it does constantly make noise. If you activate the Samsung silent mode and the fan stops, the 320 GB hard drive continues to draw attention to itself. This background noise from the hard drive registers as 29.6 dB(A). When the reading and writing heads are also clicking, this brings the noise level to 30.8 dB(A). In short: if it weren't for the spinning hard drive, the Samsung E21 could be completely silent while e-mailing and surfing the net. But the fan only switches itself off when the user activates the Samsung silent mode via the Fn key. The three available running modes are silent, normal and speed. 'Silent' immediately silences the fan. It does not come on again even during short periods when the processor is being used heavily. Only lengthy processor benchmark tests produce so much heat that the fan has to start up. If you remove the load from the processor the fan immediately goes quiet again. The disadvantage of silent mode: it limits the clock speed of the already slow 2.0 GHz T4200 processor to 1,200 MHz. This is enough for surfing the web or typing in Word, but you do not want to be editing pictures in this mode. We consider silent mode to be very practical for an office laptop. When the fan is running normally, it is still no louder that the hard drive. The noise when both processor and graphics card are subjected to heavy use is 29.8 dB(A). This is a very low volume level. Sensitive users in very quiet workplaces may hear the fan noise pulsating. But most users would have to put their ear to the machine to hear any such thing. While surfing the internet and with silent mode activated, the laptop's case remains remarkably cool. The fan is inactive almost all of the time in this mode. The only surface which is warm to the touch is right in the area of the fan vent. 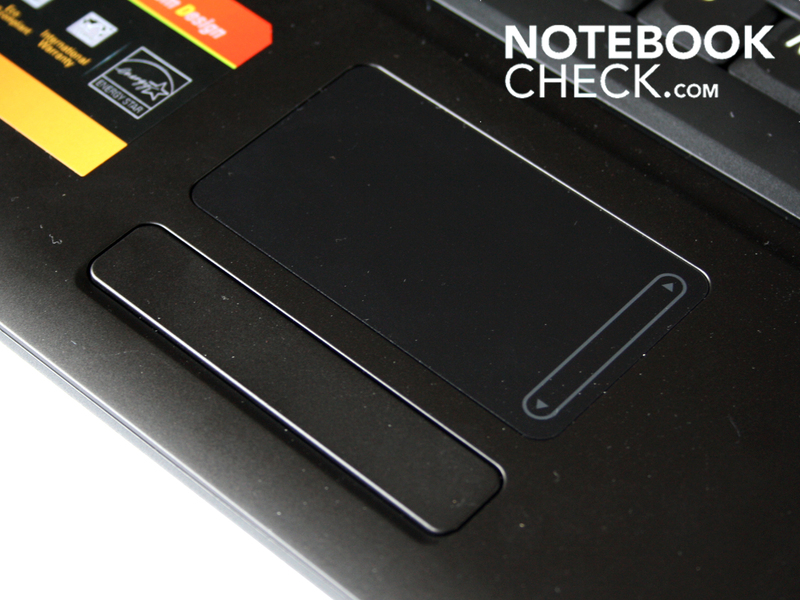 In this mode, the upper side of the notebook is only faintly warm in the left-hand palm rest area. Using the E251 on your lap under these conditions would not present any problems whatsoever. On the palm rest area we measured 30 to 32 degrees C. If you activate normal mode, you can lower this temperature somewhat with the help of the fan. 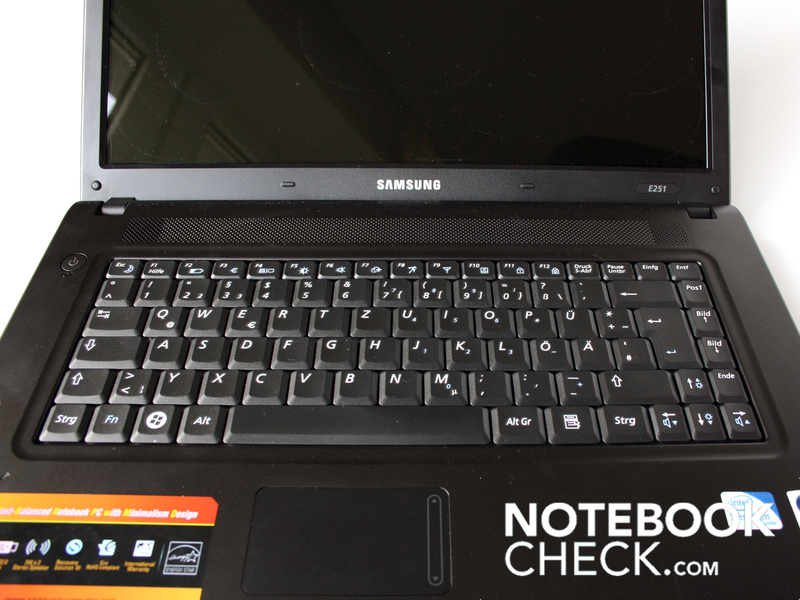 Subjecting the Samsung E251 to heavy use (CPU and GPU) does not produce any nasty surprises. After a two-hour long stress test with Furmark and Prime95, the upper surface reaches a maximum of 34 degrees. We measured this high temperature on the right-hand palm rest area. The base unit can also sit on your lap without a problem, as we measured a maximum of only 32 degrees in two places on the underside. 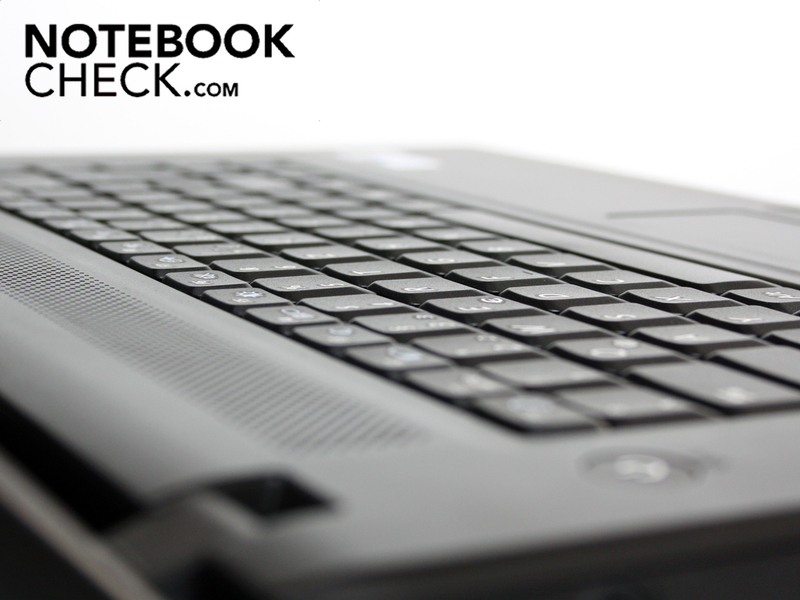 On the whole, office notebooks do not belong to the acoustical elite, and this is also true of our test model. Low frequencies are reproduced clearly by the stereo speakers above the keyboard. But higher frequencies are too strongly emphasized. 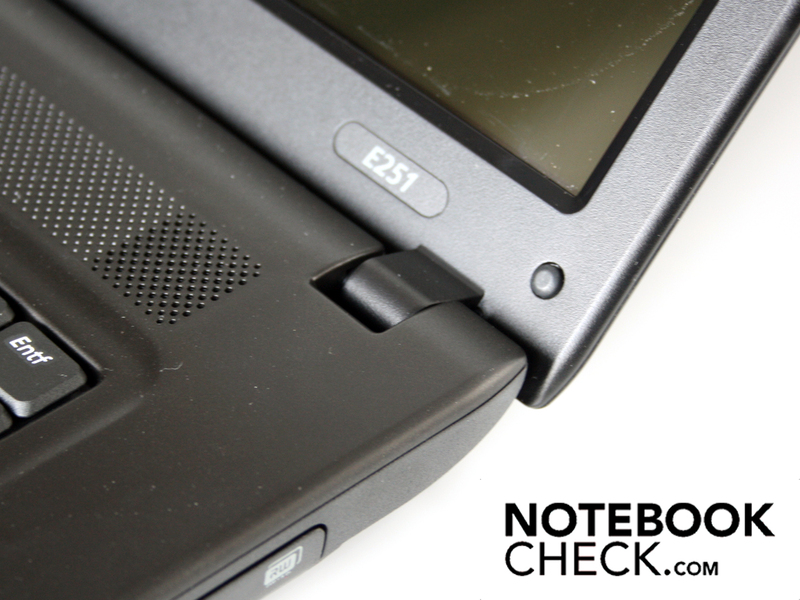 The E251 does not have a subwoofer Nevertheless we were surprised by the sound quality of the notebook. If you don't mind the effort of optimising the sound quality in the SRS sound menu, then you can actually get the speakers to produce good results. You may want to connect up an external sound system using the 3.5 mm audio out socket on the left-hand side. We tested this with two Yamaha speakers (YST-M20SDP). The sound level of the notebook can be turned down as desired. Even with a low input volume, the external loudspeakers do not hum, despite the onboard sound card. When the notebook's volume is turned up to the maximum, you get a relatively loud volume level from the headphone output. Surfing the net, sorting out your tax return, or watching a DVD; these are all activities that you might typically use your E251 Esilo for. 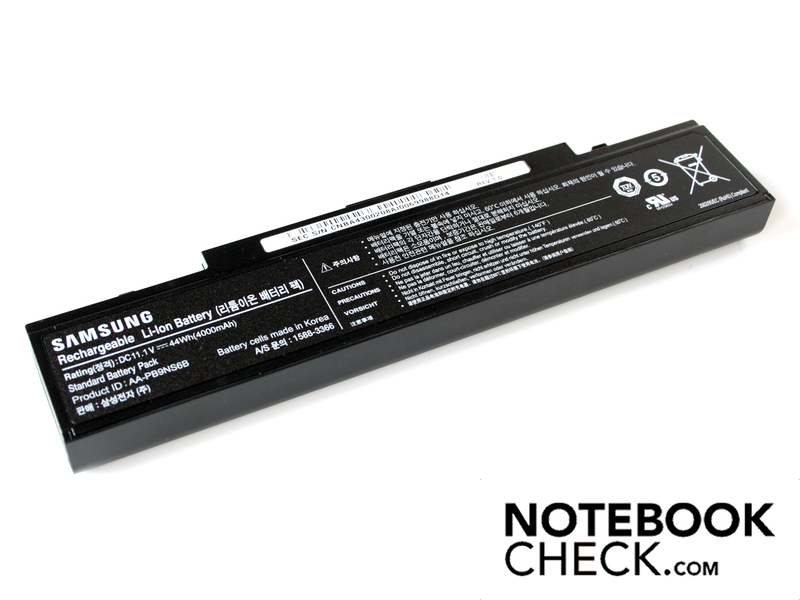 They can also be done on battery power, as the notebook can last for a good 3 hours (173 minutes) away from a power supply, when watching youtube videos or reading news websites over WLAN. This is a good result, which can only be significantly improved in a 14 or 15-inch format by expensive CULV (Consumer Low Voltage) subnotebooks. The maximum battery life of the Samsung E251 Esilo is around 258 minutes (4 hours 34 minutes). However this time is unrealistic, as it was achieved in idle mode (Battery Eater Readers Test). This means that WLAN was deactivated, the screen brightness was at its lowest setting, and there was no real effort required of the processor. The more realistic battery life is between 2 and 3 hours. If you are watching a DVD then it is more like 2 hours. 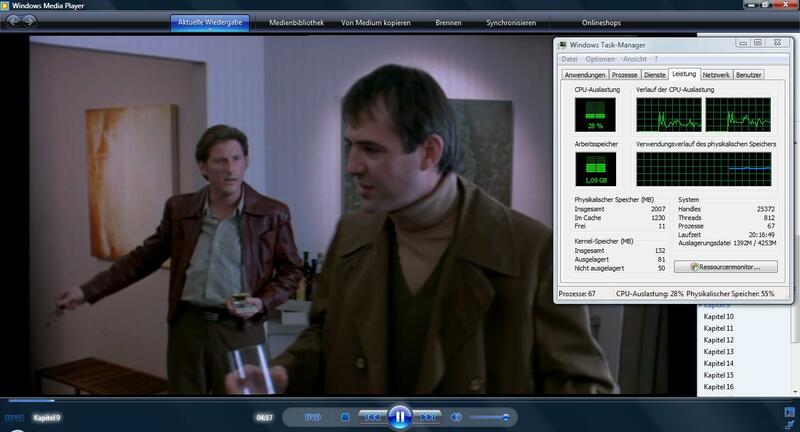 We managed a run time of 127 minutes during DVD playback. Three hours is possible for web surfing, if the processor is not given other activities to do at the same time. 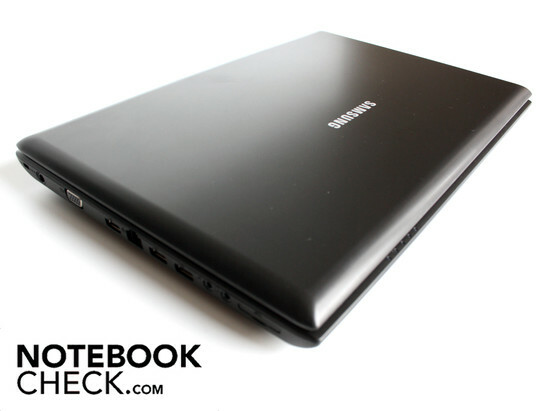 The battery life is not the absolute best, but for an affordable laptop like the Samsung E251 Esilo it is nothing to be ashamed of. The Samsung E251 Esilo offers a low level of energy usage. Its average power consumption of 38.1 Watts while under the simple stress of a 3D benchmark test is in the normal region for office laptops without a dedicated graphics card. The power consumption when not under stress might seem to be rather high at 17.5 Watts, but this is not the case. Only systems with ultra-low voltage processors like an SU2700 or SU7300 can achieve a significantly lower power consumption in idle mode. Energy-conscious users should watch out for the power consumption of the Samsung E251 Esilo in standby. In Window's energy-saving mode the mains adaptor draws 0.5 Watts while the processor is inactive and the battery isn't recharging. However when the E251 is in standby, it still draws 0.4 Watts. Samsung's E251 Esilo is a 15.6-incher which covers the basics. 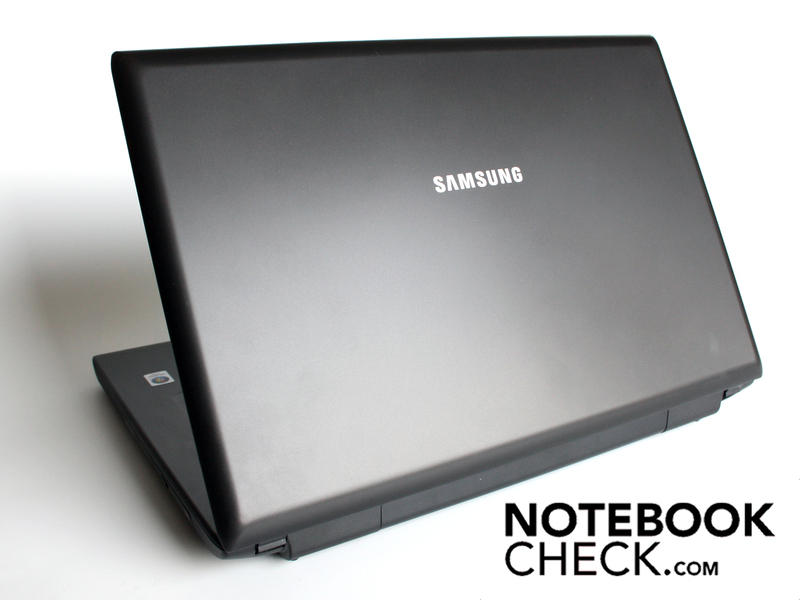 For a low cost, you get a premium brand laptop, although apart from the Samsung logo there is not much premium about it. The workmanship is mediocre, like the input devices, and visually it is hugely uninspiring. 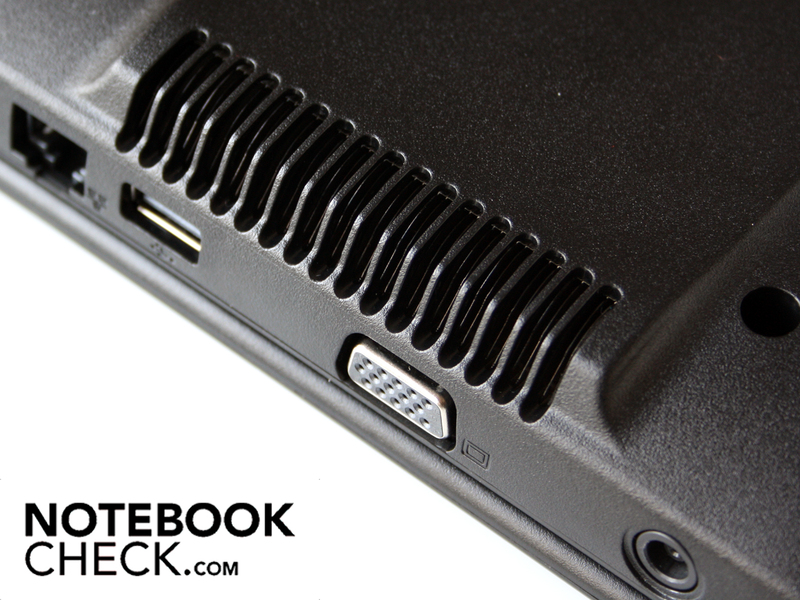 The range of ports is best described as spartan, with not even an HDMI port for connecting to a TV finding its way onto the notebook. Despite all this there are some good reasons for buying the E251 Esilo. From an ergonomic perspective, it is exemplary. The heat build-up is minimal, whether under heavy or light use, and so it is always possible to work with it on your lap. The fan volume is even more impressive, mostly because the user can almost completely silence it using the Samsung silent mode. The only slight disappointment in connection with this is the background noise of the 320 GB hard drive. The Samsung E251 Esilo can be recommended to anyone who is looking for a quiet office companion but has the most minimal demands in terms of performance. 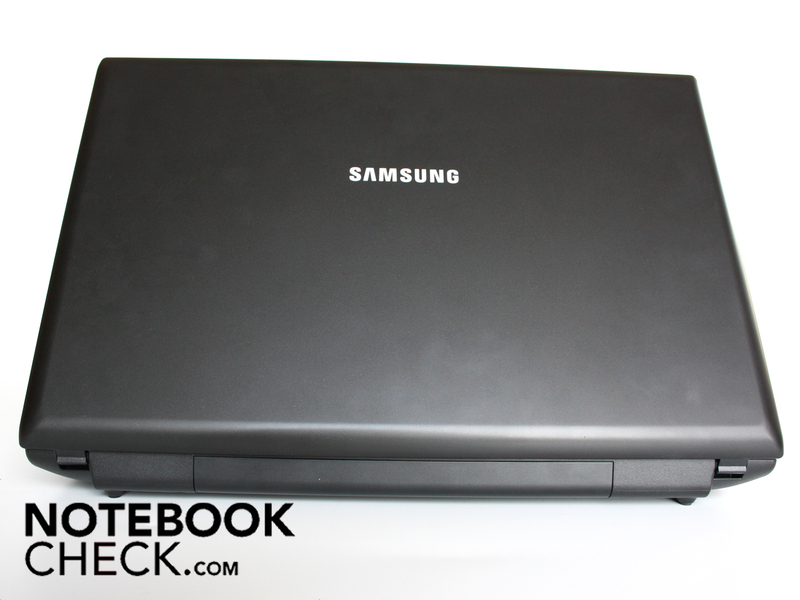 Samsung's 15.6-inch E251 Aura Esilo is a fairly nondescript notebook. The laptop's underside can be bent in places. 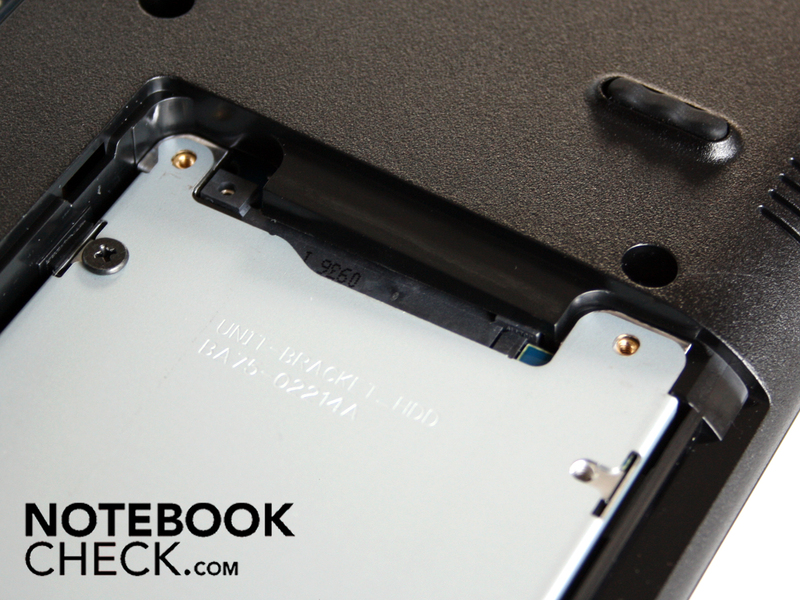 We wanted to see the notebook's internal components, and first removed the 4,000 mAh battery. The mains adaptor is small and weighs only 248g. 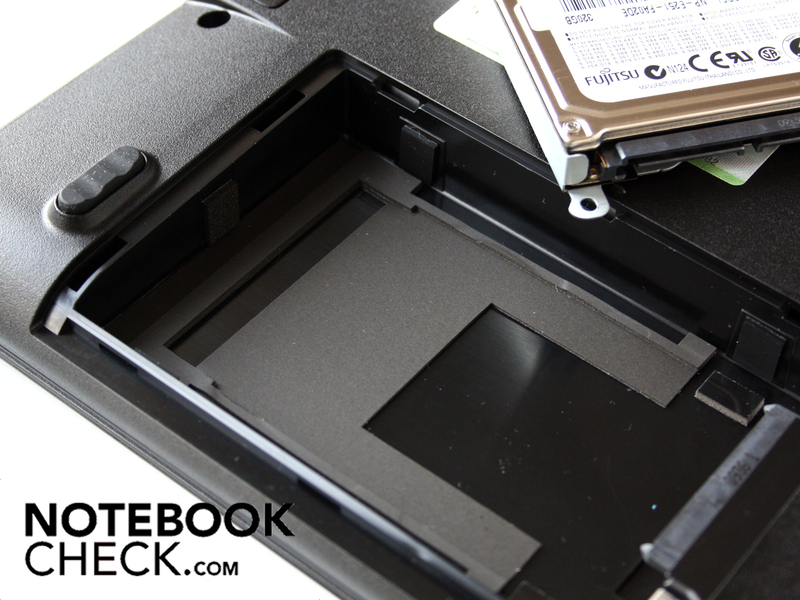 Two panels on the underside of the notebook give access to the hard drive and the memory. The Fujitsu hard drive sits on a rubber mat. This helps dampen the noise. In this model the hard drive is not mounted with screws. The hard drive has a total capacity of 320 GB (MHZ2320BH). 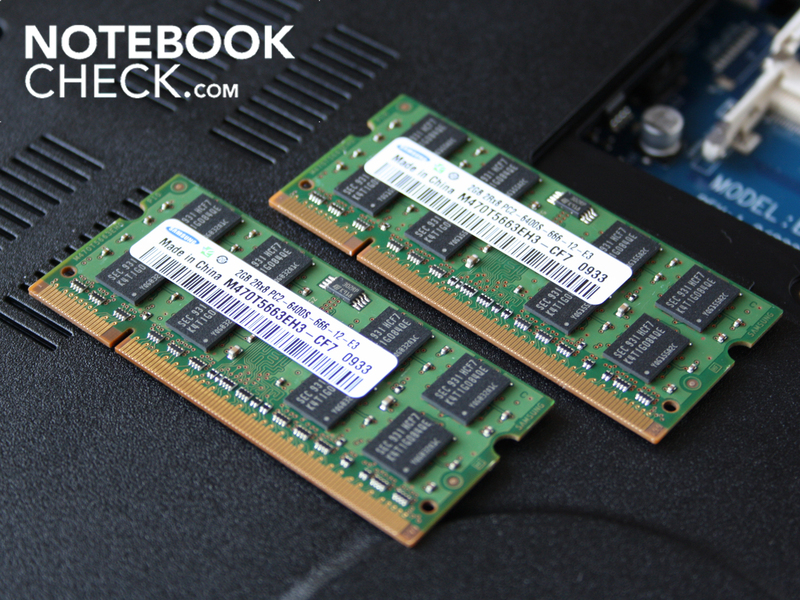 The E251 has 4 GB of type DDR2 RAM. Both slots are filled. At least there is an integrated 1.3 megapixel webcam. Typical Samsung design elements are missing from this 15.6-inch machine. This could just as easily be the logo of a complete unknown. Even the loudspeakers are housed under a bog-standard perforated surface. The lid is matt and does not attract many fingerprints. The workmanship and robustness overall are good but not perfect. The lid can be bent slightly. We also had some issues with the keys. The tactile feedback when typing is spongy. The range of ports is rather spartan; they all fit onto the left-hand side. The hinges hold the lid firmly in position. 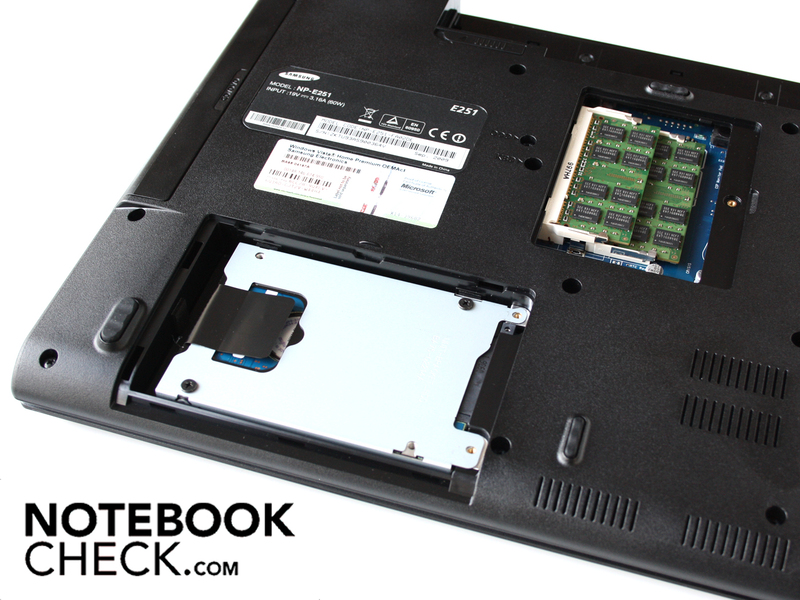 The notebook is powered by a 2.0 GHz Intel Pentium Dual Core T4200 processor. Our test model was running Windows Vista. There were not really any design highlights. Above: the power button which does not glow. In any case the 32-Bit Vista operating system can only utilize just over 3 GB of the RAM. Perfect for fans of peace and quiet. If you could just fit it with an SSD you would barely hear a sound out of it. 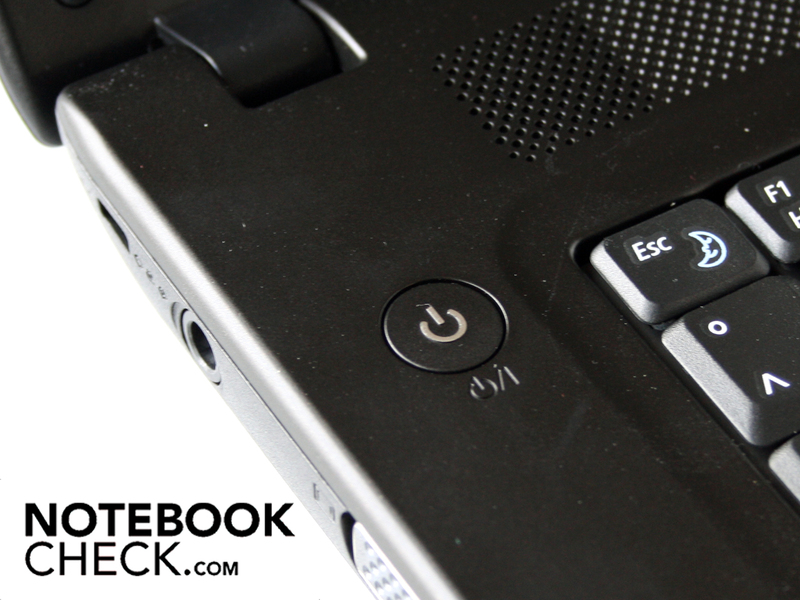 A keyboard with good tactile feedback and a number pad would have improved this notebook. How quickly Samsung has come down to previously unthinkable pricing levels, deviating from its premium branding. The Samsung homepage does not mention the existence of the E251 series. 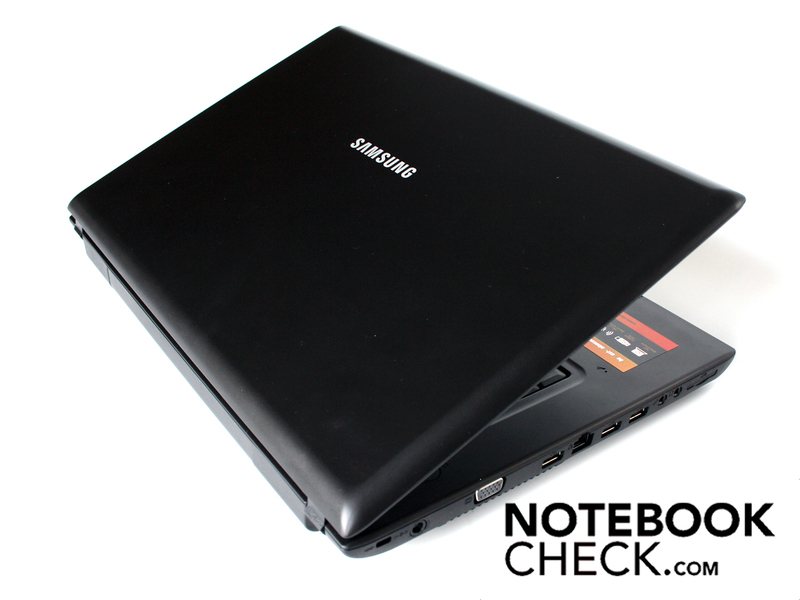 You can judge a laptop by its enemies... Acer's Extensa 5230E is a direct competitor. 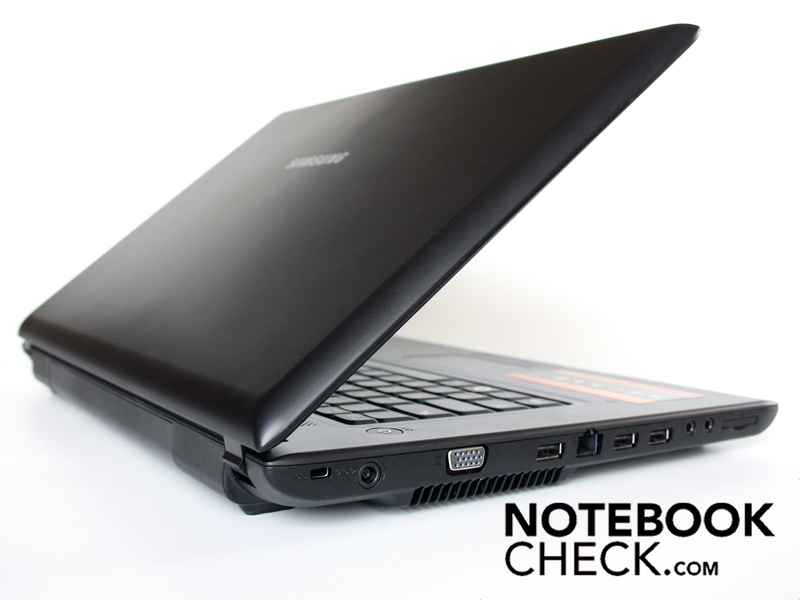 Lenovo also offers a reasonably priced office laptop in the G550 series.